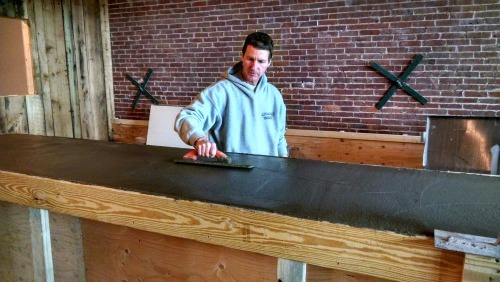 That's me Mike Day, finishing a concrete countertop. It was the summer of 1981, I just completed my sophomore year in high school when I started pouring concrete floors for a local business in town. While working for this company, I installed concrete floors for large commercial buildings, schools, malls, hospitals as well as residential homes and garages. Since a lot of the concrete floors we installed were very large, I learned very quickly how and how not to work with concrete. I had a tremendous amount of "hands on" experience pouring and finishing concrete floors while working for someone else. With all the knowledge I had gained about concrete, I decided to start my own concrete flooring business in 1986. I was 21 years old and very motivated to be my own boss! Concrete, like most everything, has really evolved over the years. Not wanting to fall behind or lose my competitive edge, I have taught myself, learned from others, or have been professionally trained in many types of concrete applications. 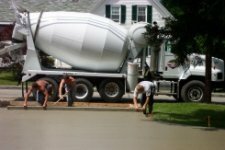 As you can see, I have been busy learning and applying these techniques and continue to do so today for my business in Maine called Day's Concrete Floors, Inc.
That's us above pumping, pouring and troweling a big slab. It took me a lot of time (years) and effort to learn all those different applications I mentioned above. Most of the learning was "on the job training" (sometimes the best kind) and some was from going to seminars and classes. The "on the job" knowledge is where I really learned what works best and what doesn't work so well. This knowledge is how I think I can help you the most! With over 30 years of pouring concrete, stamping, staining, forming slabs, repairing concrete, applying concrete sealers and learning from my own mistakes. I can share that information with you through this website. Go ahead and read the pages that interest you. Use the search bar at the top of the right hand column to find what you're looking for. Or ask me a question! No sense of keeping all this experience and information to myself, enjoy! 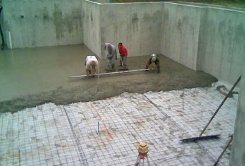 Here we are pouring a basement floor and a concrete driveway. My beautiful wife, Karen, and I have been married since 1992. We have two great kids, Tia, our daughter and Tyler, our son. We live in a small town in central Maine near the capitol city of Augusta. When I'm not working in concrete I enjoy spending time with the family, playing sports, building this website, and coaching my daughters basketball team. Living and working in Maine is really quite nice! Thanks for visiting my site and come back soon.